DIY Marble Maze: Create a labyrinth and run it on a tilt board or in VR. Set up and solve a marble maze of your own making. With the Design Your Own Marble Maze kit, you become the architect. Add wooden wall blocks to the high-quality captive tilting box and finish it off with start and end points. 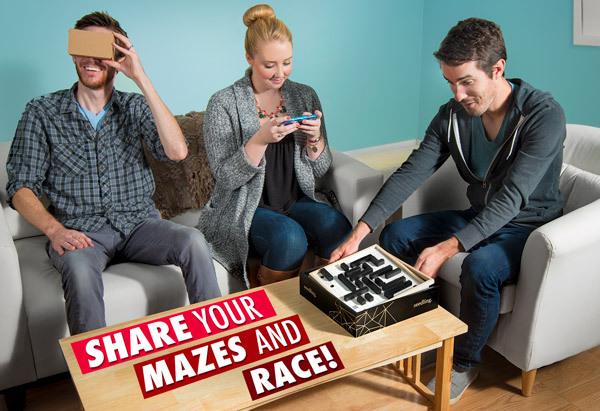 You can play your maze by tilting the knobs on the box like a traditional tabletop labyrinth or capture the board and import it onto a free app to play in virtual reality. Put on the included VR headset and transport yourself into the maze you just created! 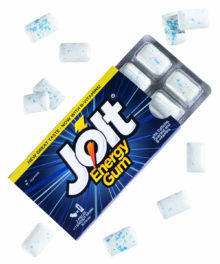 Add moving hazards and power-ups and literally run your marble maze. You can even share your maze with your friends! Design, play, and share a marble maze of your making. Design Your Own Marble Maze is the name of the game, but it doesn't stop there—you get to play it too! Of course the kit includes everything you need for a marble maze from the floor to the walls (and don't forget the marble). It also includes a multi-axis labyrinth box to tilt your maze as you run it and virtual reality goggles to put you inside your own maze. Each maze starts on the same 18 x 18 grid, but you can still make every maze unique. Use the included adhesive in conjunction with the collection of wooden blocks to make twisty, turning avenues from start to finish (with more than a few dead-ends added for fun). Poke out perforations in the maze floor to create holes that act as pitfalls for careless marble rollers. Once you're satisfied with your meandering maze, place the puzzle in the labyrinth box to play it. Mazes built from the ground up. 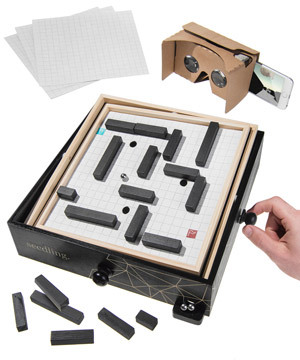 With this marble maze creation kit, there are two ways to play: you can use the classic method of tilting the knobs on the labyrinth box or you can digitize your maze and play it in virtual reality! 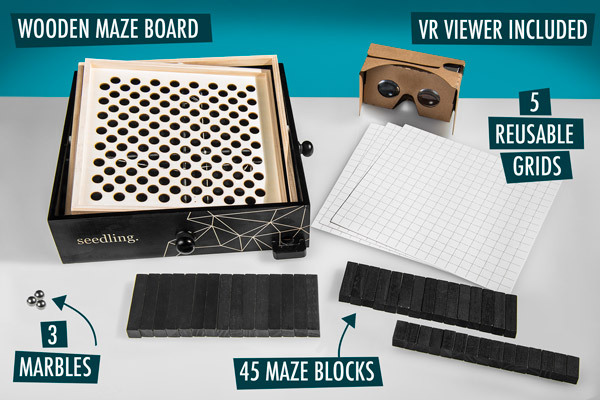 Every Design Your Own Marble Maze includes a cardboard VR viewer, composed of a smartphone holder and a pair of lenses that give you the sense of being inside the maze. Pull out the smart device you already own, download the free app, and snap a pic of your maze. Insert your device into the VR viewer and peer into the goggles to see a 3D rendering of your maze. After completing your maze masterpiece, challenge a friend or family member to solve your maze on the labyrinth and watch them struggle to solve your devious creation. Because you can digitize your maze, you can post it for others to play in virtual reality as well. You can even use multiple smartphones to compete head-to-head! Design Your Own Marble Maze is a box that contains everything you need to create a whole mess of mazes. If you want to play in virtual reality, you'll need to bring your own iOS or Android device to add to the included VR viewer. The box also includes a high-quality tilting wooden labyrinth, 45 wooden maze walls, 5 reusable paper grids, adhesive stickers for the walls, start and end indicators, three marbles, and instructions. 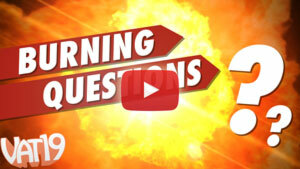 Jon and Joey, members of the Vat19 video team, take a first look at this DIY Marble Maze. Jon and Joey take a first look at the DIY VR Marble Maze. Question: How do you play the maze? Answer: To play the maze on the tabletop labyrinth, use the knobs on the outside to tilt the board. 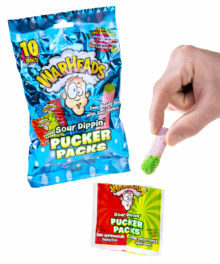 This will cause the marble to roll where you want it to go. To play in virtual reality, follow the instructions on your phone after you've slipped it into the cardboard goggles. Question: How long does it take to solve a maze? Answer: It depends on how good the cheese is at the end. 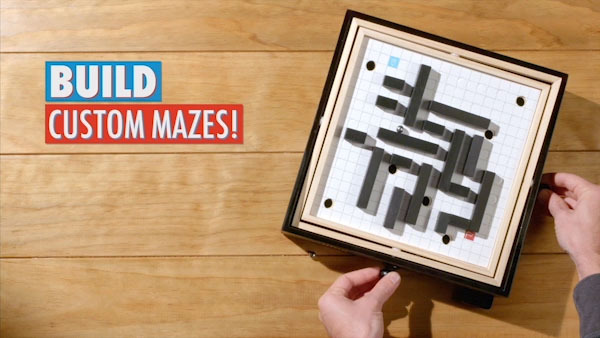 Outwit your friends by designing the most difficult mazes!